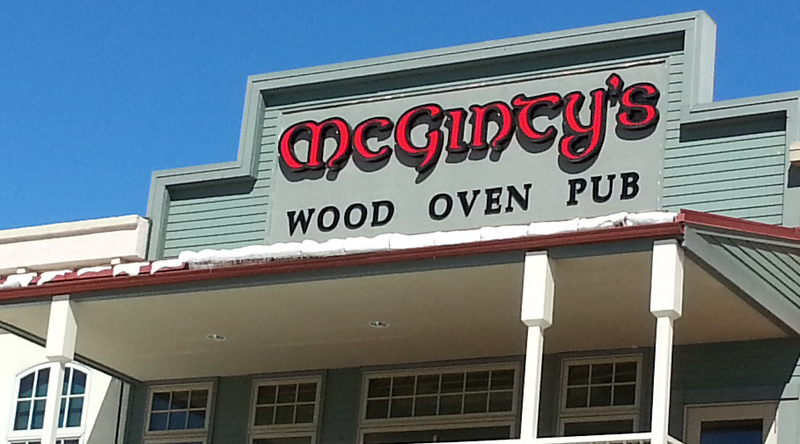 The menu at McGinty’s Wood Oven Pub identifies the restaurant as “A Touch of Ireland in Colorado!” This is no delicate light-handed touch, though. It’s as if every day was meant to celebrate St. Paddy. The odd thing is that it works. Nearly every menu item is a spin on something Irish: from appetizers heavy on cheese, the color green and stout to the entrees, including the pizzas, also known as “Patty Cakes.” But first, back to the appetizers. 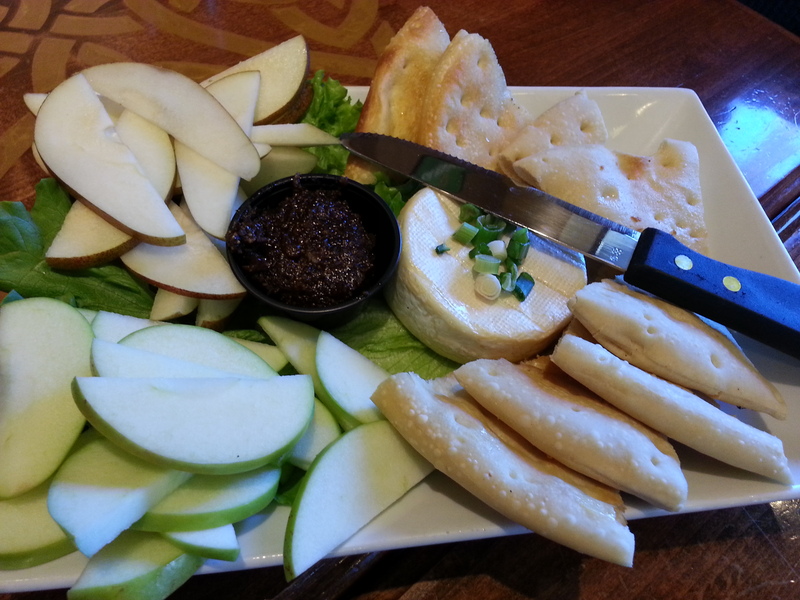 We ordered the Brick Oven Brie served warm, but not gooey, so it spread easily over pieces of flatbread, slices of pears and apple. 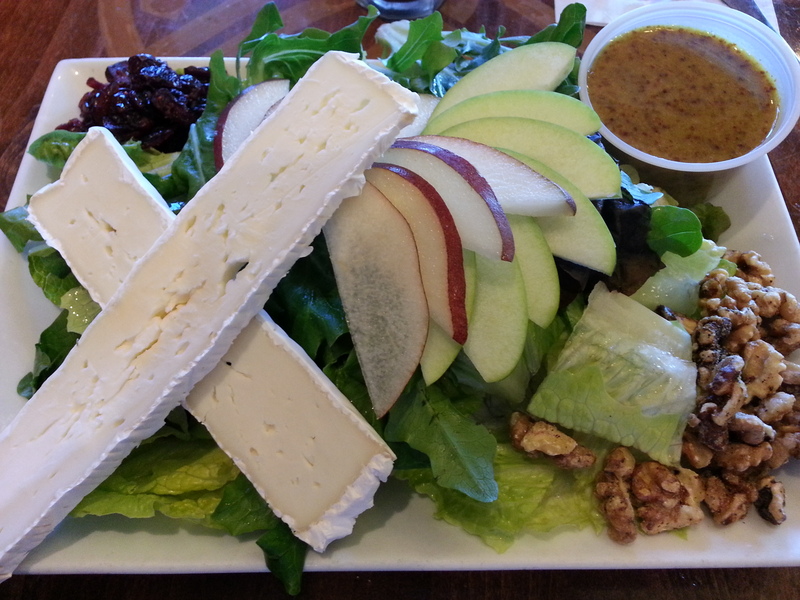 The star of the plate was the fig jam which complemented the smooth, creamy brie. We were amused, but not tempted, by the Hun Lee O’Connor: egg rolls filled with corned beef and cabbage. Since it was lunch I didn’t want anything very heavy, the Fields of Anthenry Salad seemed a nice fit. The large plate of field greens was difficult to eat; and maybe having a second dish with brie was not the best choice, but the honey mustard vinaigrette provided a nice zip. The salad was an impressive combination of flavors and textures. The menu also features an array of sandwiches, several soups, the aforementioned pizza, as well as pizza pot pies. Although we weren’t there on St. Patrick’s Day, it was close enough so we ordered Guinness with Chambord. The combination, while sublime, transported us, but not necessarily to the Emerald Isle.